I have designed the ScanConverter in 1995 as a simple means of getting to the Fiero's data stream. But due to its simplicity, the design had a few drawbacks, the most serious one being the power supply: a 9V clip for a 9V block battery. That saved me from designing a bullet proof (read: expensive) power supply that can handle all the noise and voltages present on a "dirty" vehicle power supply. Recently I found a USB to serial converter chip by FTDI that promised a simple interface between anything with a serial port and a PC with USB. Since my subnotebook doesn't have a serial port, but does have a USB port, I found the idea intriguing. The new design has several advantages over the old one. The main advantage of course being powered through the USB-Bus, so there is no need for a power supply anymore. No more cables attached, only a USB connector and three prongs for the ALDL port. If your cable breaks, just go to the nearest computer store to get a new one. Also, no hassle of finding a free COM-Port, setting baud rates, etc. Literally plug and play! The software has also been completely rewritten, since nobody uses a DOS box anymore. So if you live in the Windows world, the software is written in Visual Basic instead of QBasic and you can modify the Scantool program to make it fit your needs! The USB-ScanConverter is now available exclusively through the Fiero Store! Based on the previous ScanConverter, I designed a circuit around this very interesting chip. As you can see, it is entirely made up of surface mount components, which helped to keep it small and handy. 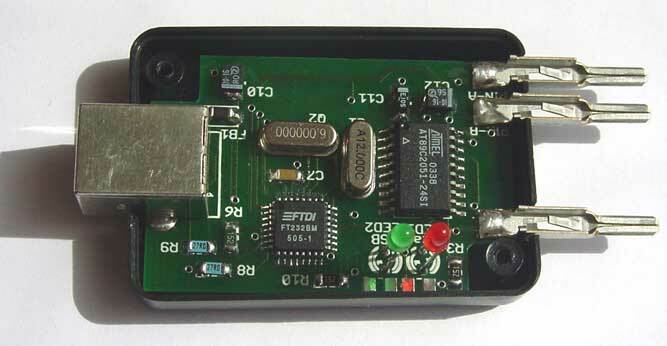 Originally, there were two LEDs on the board; the red LED lights each time the USB-ScanConverter receives a data frame from the ECM. The green LED lights each time the USB-ScanConverter communicates with the PC. But since both LEDs light up simultaneously anyway, I eliminated the second LED, and the final version only has one LED. The software is really simple and easy to use. No graphical gadets, no log files. As you can see, it shows you all relevant data in plain English, in real time. Since the Fiero ECM is almost antique, the data update rate is about 1.5 seconds. Don't blame the Scantool, that's the ECM's fault. There are two separate versions of the program for the V6 and 4-cylinder Fieros. Just start the one that is correct for your engine, the USB-ScanConverter will be set to the correct operating mode when you press "Start". Now plug the ScanConverter into your ALDL-Port, which is located behind the cigarette lighter cover on the center console. Within a few seconds the red LED will start flashing, indicating the Scantool is receiving data from the ECM. Next you can press "Start" in the scantool program, and the window will start displaying the data sent by the engine. When you're done, press "Quit" to exit the program. As with almost all hardware, the first thing to do is to install the driver, which is easy: just plug the USB-ScanConverter into your PC. Windows will recognize it automatically, and of course won't find a driver in its database, so you need to point Windows either to the CD-ROM with the driver on it, or to the directory where you unzipped the driver files. The "Driver"-directory contains the USBscan.inf file Windows is looking for. Then you need to install either or both Windows programs. They're called SetupV6.exe and SetupL4.exe respectively. The archive also contains the source code to these two programs in Visual Basic 6.0, so feel free to take a look around the source, it's meant as a starting point for your own experiments, but is a fully functional scantool program designed to work with the USB-ScanConverter. As for the CPU, the software inside the CPU is in revision 1.4 and runs very stable. Oh, if you're looking for the source code or a hex dump of it, look no further. I am not providing the source code or binaries, because I don't want people making money off of it. A lot of effort went into this gadget, and I don't want to see my work published on all sorts of sites.